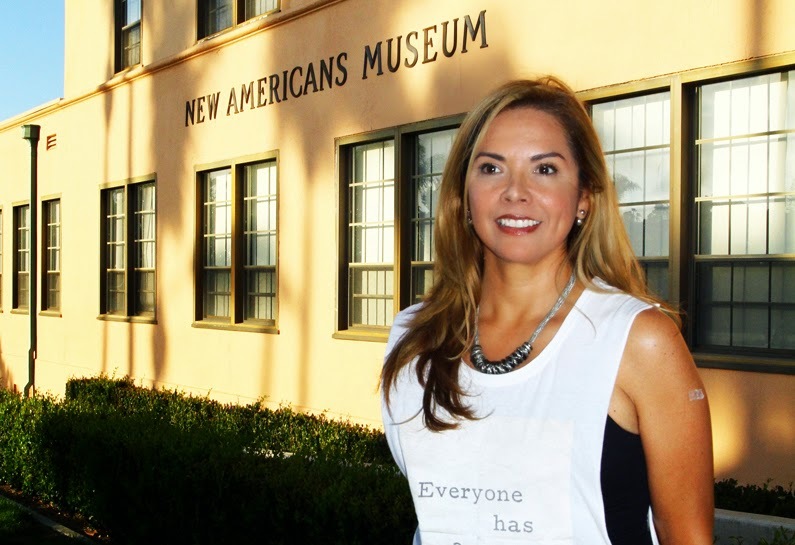 Linda Caballero Sotelo has been tapped to help the New Americans Museum. Linda Caballero Sotelo never expected be running a museum, especially a museum dedicated to the newest Americans. The brain-child of 91-year-old visionary founder Deborah Szekely, the New Americans Museum at Liberty Station in Point Loma near San Diego is undergoing a rebirth under the stewardship of Caballero Sotelo, a former President and CEO at the San Diego Hispanic Chamber of Commerce. “I met Deborah about 15 years ago at a dinner she hosted in her home when she was a board member at the National Council of La Raza,” says Caballero Sotelo. Szekely, she says, is a former director of the Inter-American Foundation in Washington D.C.
Caballero Sotelo is no stranger to the art world. Her work in the arts encompasses high level involvement as senior staff at INSITE ’97, the internationally acclaimed US/Mexico public art initiative where she organized and collaborated in the development of over 80 original public art installations and exhibition-related commissions and works by artists from throughout the world. While her career path has led her to management and executive roles in both the public and private sectors, she is excited and proud to be the first immigrant to head a museum dedicated to engaging audiences about the immigrant experience and their contributions to the social, economic and cultural fabric of the U.S. Located at Liberty Station, an arts district that occupies the former site of a naval training center, the New Americans Museum, Caballero Sotelo explains, will not simply focus on the collection and exhibition of artifacts, but will instead make the collection of living, breathing narratives and stories a major focus. According to Caballero Sotelo, Szekely has always been concerned with young people. She founded the museum 10 years ago in order to help the children of immigrants feel more connected to and proud of the sacrifices their parents made in order to create a new life in U.S. The museum was envisioned as a place where they might come to see how their parents came with almost nothing except hope and the idea that hard work would allow them to build better lives for themselves and their families. Born and raised in Tijuana, Caballero Sotelo studied at UCLA and received her Bachelor’s degree in International Relations & History at US International University. She earned a Master of Arts degree in International Business & Economics, with a marketing concentration at Webster-Regents College, UK with studies at the London School of Economics. Caballero Sotelo has been a contributing writer, editor and speaker at numerous publications and institutions. More recently, she has worked as a guest curator as well as lead organizer and producer for a broad cross-section of large scale events, festivals and visual arts exhibitions, including this year’s blockbuster exhibit of glasswork by internationally renowned Mexican artists Jamex and Einar De la Torre, playfully entitled “Whysydro” at The Front, an avante-garde artspace in San Ysidro, California. While she is excited about the audience engagement that occurs as a function of bringing curators and museum-goers together for an indirect dialogue, she is even more excited about the educational components she and her team are building around the museum exhibitions programmed for 2015. “We already have 11 school tours booked,” she says proudly of the Jan. 16th inaugural exhibition which will feature tapestries made by women from a cooperative in Colombia and a parallel exhibition of photographs, interviews and video put together recently as a way to contextualize their experience in a contemporary setting.